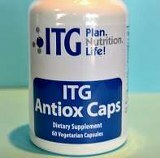 ITG Antiox™ synergistically combines many nutrients that have a positive effect on the immune system. This formula contains multiple nutrients known to raise glutathione levels making it helpful for supporting phase II liver detoxification. It also combats free radicals and helps detoxify harmful chemicals including heavy metals. L-Leucine when taken with NAC prevents mercury from being reabsorbed into the cen­tral nervous system. Detox Antiox™ is also designed to aid the production of metallothionein. The vitamin E is 60% gamma, mixed tocopherols. Lipoic acid regenerates vitamins E and C and supplies sulfur for detoxification. This powerful formula also provides the well-researched antioxi­dants green tea, grape seed extract and curcumin.